The genus Bradypodion was erected by Fitzinger in the year 1843 with the type species B. pumilum (Daudin, 1902). In 1864, Gray (1865) described two new genera: Microsaura and Lophosaura. These two genera were not widely used and neither was Bradypodion for the dwarf chameleons in south of Africa (see Klaver & Böhme 1997). 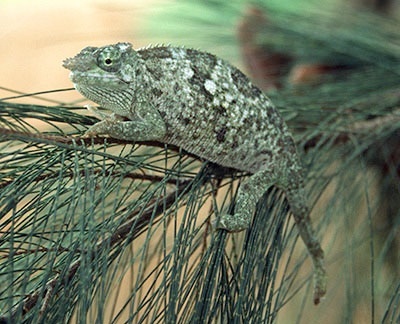 Raw (1976) described new species from South Africa and revalidated the genus Bradypodion for the dwarf chameleons from southern Africa. Klaver & Böhme (1986) then investigated the lung and hemipenis morphology of the whole family Chamaeleonidae and divided the family into two subfamilies: Brookesiinae (with the two genera Rhampholeon (distributed in Africa) and Brookesia (distributed in Madagascar)) and Chamaeleoninae. The latter was divided into four genera. Two (Chamaeleo and Furcifer) were clearly defined by morphological, lung and/or hemipenis synapomorphies. The rest of the Malagasy species (incl. tigris from the Seychelles) and the rest of the African species didn’t have synapomorphies. They were classified as two own genera (Calumma (Madagascar) and Bradypodion (Africa)) because the species contained in each certainly did not belong to Furcifer or Chamaeleo respectively sensu Klaver & Böhme. Therefore Klaver & Böhme applied the oldest available genus name for each group that had been applied to a member species of these respective groups. 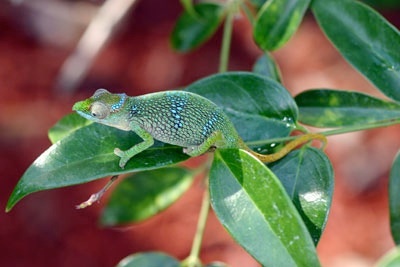 They believed this, “despite its shortcomings, ... to be a better concept than that which lumps all ordinary chameleons in one genus Chamaeleo ...” (Klaver and Böhme 1997). The name for the African - admittedly symplesiomorphic - group was Bradypodion Fitzinger, 1843 (type species Chameleo pumilus Gmelin, 1789) and was explicitly (p. 57) applied provisionally. In late 2006 Tilbury et al. published their molecular genetic study. They found that the southern African calde (Bradypodion s.str.) is so genetically different to the other Bradypodion (s.l.) species, that the status of their own genus was justified. Therefore no name was available for the species left so they described the genus Kinyongia for most of the species. The taxon “mlanjensis” from Malawi was also so genetically distinct, that for this species they also created a new genus: Nadzikambia. These names were derived from the African languages spoken in the distribution ranges of the chameleon groups concerned, which is Kiswahili for the former and ChiChewa for the latter. Unfortunately in this paper nearly all the species names they created new synonyms/chresonyms because they applied the feminine gender to the new genera and overlooked that Bradypodion is neuter. They wrote, that the names were “latinized by terminating the name spelling with the letters ia giving it a feminine gender. Thus the specific names remain unaltered.” After rumours about a short note on this mistake from some other authors, Tilbury et al. published a correction by themselves in 2007. A list of all correct spellings of the names can be found below. Recently Mariaux et al. 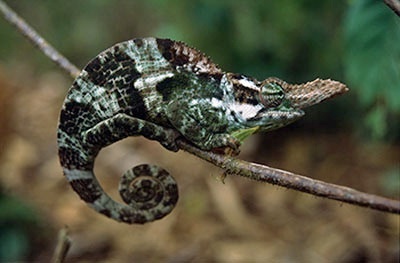 (2008) published their morphological and genetic investigations on the East African two horn chameleons, the so called Kinyongia-fischeri-group. This group included two species (fischeri and tavetana) with five subspecies (f. fischeri, f. multituberculata, f. uluguruensis, t. tavetana and t. boehmei). 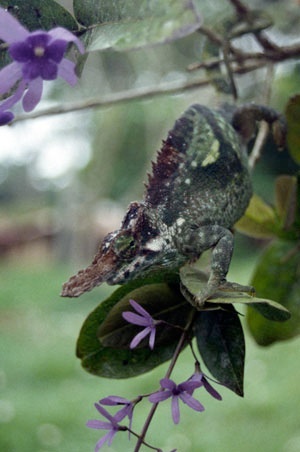 This classification was clearly unsatisfied, especially since pictures and specimens of a two horned chameleon from the East Usamabara Mountains in Tanzania were known, so called “fischeri sub. nov.” (e.g. 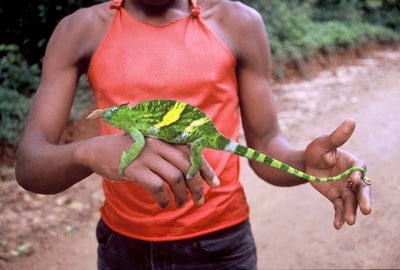 on the poster “Chameleons from Tanzania” by Beraducci). 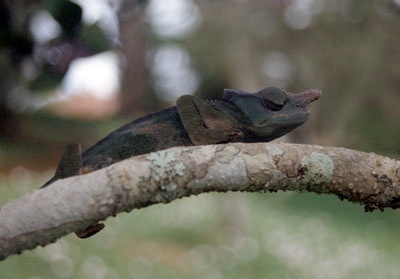 Jean Mariaux from the Natural History Museum in Geneva, Switzerland, on two expeditions to Tanzania collected specimens from nearly all mountains where two horned chameleons were known including new specimens and fresh tissue samples for genetic analysis. Additionally the authors measured seven morphological distances and observed 11 morphological characters on preserved specimens of Zoological Museums in Africa, America and Europe and found nearly all the type specimens of all described taxa of two horned chameleons. Many of the type specimens had not been located by Klaver & Böhme (1997). With on exception (see below), the results of the morphology and the genetics fit quite well to each other and to the zoogeography. Therefore they gave all the valid subspecies full species rank and revalidated two taxa described by Nieden (1913) from the East Usamabara Mountains as full species. The most interesting result is that K. uluguruensis is more close related to the one horn species (e.g. K. tenuis) than to the other two horned species in the genetic analysis (s. also Tilbury et al. 2006). 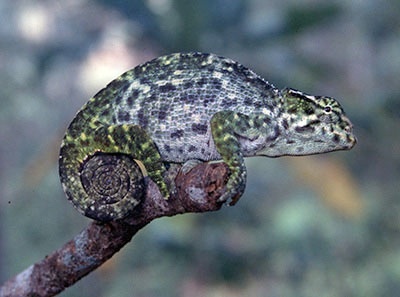 Therefore there is no monophylie in the two horned chameleons of East Africa. Another result is that the real “fischeri” is at the moment one of the rarest species of this group with only eight known specimens (five males and three females) and live only on the Nguru and Nguu Mts. The rarest and smallest one is still K. uluguruensis with no more than six known specimens and a maximum total length of 18,7 centimetres. The species from the East Usambara Mts., which was called in the pet trade “fischeri fischeri”, is K. matschiei (Nieden, 1913), and the so called “fischeri sub. nov.” from the same mountain range is K. vosseleri (Nieden, 1913). These two species are sympatric and differ clearly in the existence of a tail crest in males (K. vosseleri) and in the existence of horns in females (K. matschiei). 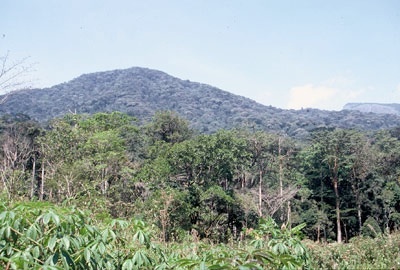 There was no evidence of two different taxa (“werneri” and “multituberculatus”) in the West Usambara Mts. like Nieden described in his paper in 1913. So the taxon “werneri” (which is preoccupied by Ch. werneri Tornier, 1899) is still a synonym of the taxon “multituberculatus” Barbour & Loveridge (1928). The new combination of the genus and species name has to be Kinyongia multituberculata. 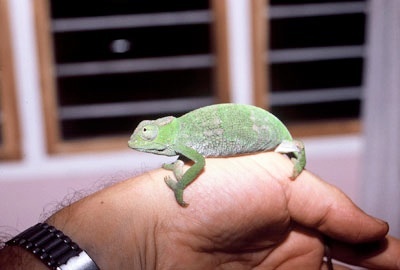 K. tavetana has the widest distribution of all two horn chameleons of East Africa. 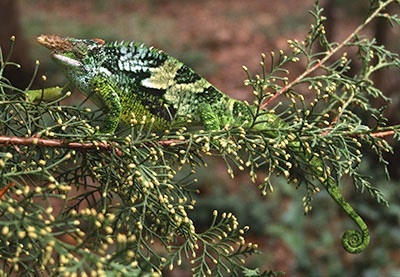 It can be found from the Chyulu Range in southern Kenya, Mt. Meru and Mt. Kilimandjaro to the North and South Pare Mts in Tanzania. K. boehmei is still known only from the Taita Hills in Kenya. 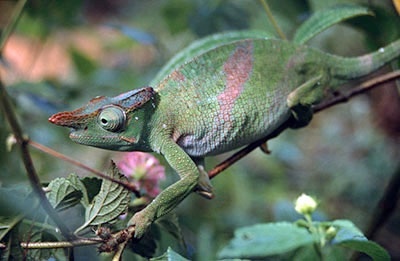 The publication also provides a good dichotomous key for all the two horn chameleons in Eats Africa. Barbour, T. & A. Loveridge (1928): A comparative study of the herpetological faunae of the Uluguru and Usambara mountains, Tanganyika territory with descriptions of new species. - Memoirs of the Museum of Comparative Zoology, 50: 86-265. Fitzinger, L. (1843): Systema Reptilium, fasciculus primus, Amblyglossae. - Braumüller & Seidel, Wien: 106 S.
Gray, J.E. 1864 (1865): Revision of the genera and species of Chamaeleonidae, with description of some new species. - Proc. Zool. Soc., London: 465-477. Klaver, C.J.J. & W. Böhme (1986): Phylogeny and classification of the Chamaeleonidae (Sauria) with special reference to hemipenis morphology. - Bonn. zool. Monogr. 22: 1-64. - & W. Böhme (1997): Chamaeleonidae. - Das Tierreich, Berlin, 112: I-XV + 1-85. 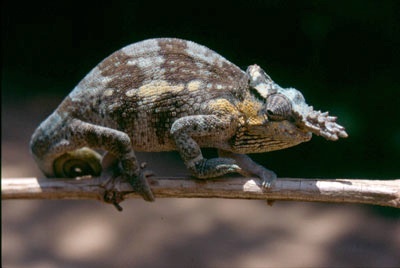 Mariaux, J., Lutzmann, N. & J. Stipala (2008): The two horned chameleons of East Africa. - Zool. J. Linn. Soc., 152: 367-391. Nieden, F. (1913): Chamaeleon fischeri Rchw. und seine Unterarten. - Sitzungsberichte der Gesellschaft naturforschender Freunde zu Berlin: 231-249. Raw, L.R.G. 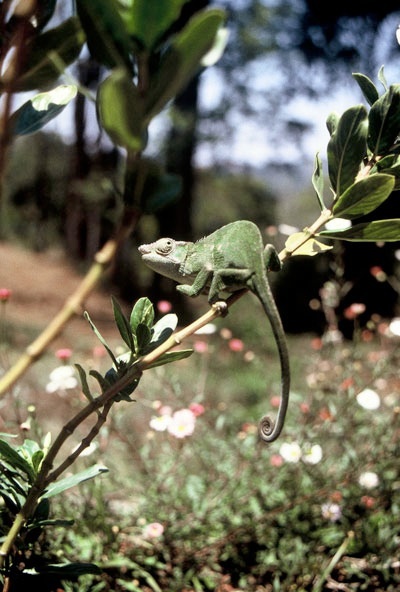 (1976): A survey of the dwarf chameleons of Natal, South Africa, with description of three new species (Sauria: Chamaeleonidae). - Durban Mus. Novit. :11(7): 139-161. Tilbury, C., Tolley K. & B. Branch (2006): A review of the systematics of the genus Bradypodion (Sauria: Chamaeleonidae), with the description of two new genera. - Zootaxa 1363: 23-38. 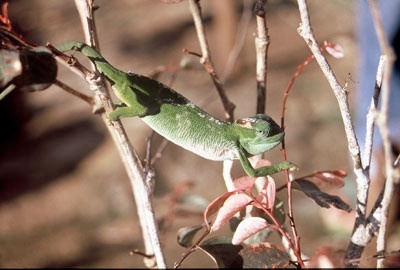 - (2007): Corrections to species names recently placed in Kinyongia and Nadzikambia (Reptilia: Chamaeleonidae). - Zootaxa 1426: 68.